Guatemalan authorities are on alert for future food shortages as the effects of a widespread Coffee Rust epidemic and climate change – most likely helping to aggravate the former – hit home. Damages caused by the bout of Coffee Rust that has hit many parts of Central America over the past few years, and which has led to tens of thousands of workers losing their seasonal jobs in Guatemala alone, have helped raise concerns about a potential food crisis in the country. Last year it declared a state of agricultural emergency after the fungus affected some 70% of the country’s coffee crops, and now national grain reserves have fallen and the country’s meteorological institute has forecast that rainfall levels this coming May and June will be well below average, with experts suggesting that the situation is a real and actual manifestation of the impacts of climate change. Luis Monterroso, the head of Guatemala’s Secretaría de Seguridad Alimentaria (Sesan – Food Security Agency), has warned that at least 40,000 families will be at risk of food scarcity over the coming year, a potential phenomenon that Guatemala can ill afford given the instances of malnutrition and food insecurity already prevalent across the country. Those who usually rely on seasonal employment based around coffee cultivation, but who have lost their jobs due to reduced harvests brought on by the Coffee Rust, have been forced to migrate to other parts of the country in order to find work and put food on their families’ tables, according to Monterroso. He has also admitted that the potential crisis would be accentuated even further if the El Niño phenomenon, which entails cyclical warming of parts of the Eastern Pacific Ocean and which can have devastating knock-on effects on global weather systems, appears. Nevertheless, Monterroso also insists that the government, led by President Otto Pérez Molina, has been well-informed about the potential food crisis, and has a definitive plan of action to face up to the impacts of such a crisis, although it will have to depend on international aid and cooperation as well. The government’s plan includes aid for small-scale and family-run farming, and community-based preventative action against malnutrition, according to the Sesan director. Coffee Rust on the leaf of a coffee plant. Coffee Rust has plagued Central America’s extensive coffee-growing regions for several years now, but the current bout has been particularly harsh. 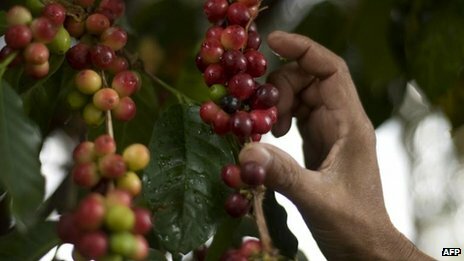 Last year, the UN’s Food and Agricultural Organisation (FAO) joined regional efforts to contain the spread of the disease, pledging to contribute some US$500,000 over two years in strengthening programmes to defend Central American coffee growers against the rust, mainly through the spraying of fungicides and improvements in early-warning systems that allow for the early detection of the fungus. Another UN body, the World Food Programme (WPF) also announced plans for financial assistance to more than 50,000 families affected by the damages done to their crops. The International Coffee Organization (ICO) estimates that during the 2012-2013 harvest cycle 441,000 people lost their seasonal jobs across the entire region, due to the fall in productivity. There is also substantial evidence that climate change may be one of the driving factors behind the most recent outbreak of Coffee Rust. Historically, the fungus would typically be found at altitudes up to 3,000 feet at most, but now it is appearing at altitudes of up to 5,000 feet as average temperatures in the affected areas have risen some 2°C since records began. Early rains and high temperature and humidity levels, most likely a result of climatic changes and unusual seasonal patterns, have also contributed to the spread of the disease by allowing the fungus to develop earlier and take producers by surprise, according to Allan Hruska, Plant Protection Officer at the FAO. Additionally, the experiences of the region’s coffee growers suggest that current strains of Coffee Rust appear to be more resistant nowadays to the fungicides that are sprayed over crops. With much of Central America, Guatemala included, still largely reliant on agriculture for its economies and its own food security, any increases in the prevalence and intensity of Coffee Rust and other similar agricultural problems could have profound social and economic effects on local communities and society as a whole. The region has been earmarked as one of the most vulnerable regions to the impacts of climate change, due to its low-lying coastlines at risk of sea-level rises, its fragile tropical ecosystems which depend on seasonal rainfall patterns, and the risk of more intense and frequent storms and hurricanes causing long-lasting damages. Coffee is one of Guatemala’s most important exports. Just how “green” is Rafael Correa?